por Bolivar Cobos (como publicado en el newsletter “En Contato”) English version at the bottom of this post. Integrado principalmente por jubilados de la OEA, el BID y el Banco Mundial, nuestro querido Club del Vino de DC cumplió en mayo pasado diez años de funcionamiento. Los socios nos reunimos una vez por mesa almorzar en un buen restaurante del área de Virginia, para disfrutar de un exquisito menú y degustar cuatro clases de vino en un ambiente de fraterna alegría. Como tradición, cada mes, en forma rotatoria, un grupo de socios compra varias botellas de vino, con un costo promedio de 15 dólares cada una. El primer vino a degustar es blanco y luego vienen tres tipos de vino tinto. Al iniciarse el almuerzo, el socio encargado describe las características principales de cada tipo de vino y el país y la región de donde provienen. Durante nuestros almuerzos tenemos el contacto fraterno de amigos de antaño y compartimos con los nuevos socios e invitados, en medio de una amena conversación en que prima la alegría. Intercambiamos comentarios sobre los vinos que vamos degustando, y nos reímos al escuchar anécdotas y experiencias pasadas. También es tradicional que cada asistente llene, si así lo desea, un formulario individual donde puede señalar el grado de alcohol, balance, aroma, color, fragancia y sabor de cada vino. Los interesados en asistir a los almuerzos o convertirse en miembros del club, deben ponerse en contacto con cualquiera de sus socios. El email del autor es bolivarcobos@yahoo.com. Eventualmente la edicion completa de “En Contato” estará disponible en el sitio: ajbid.org pag. 5. 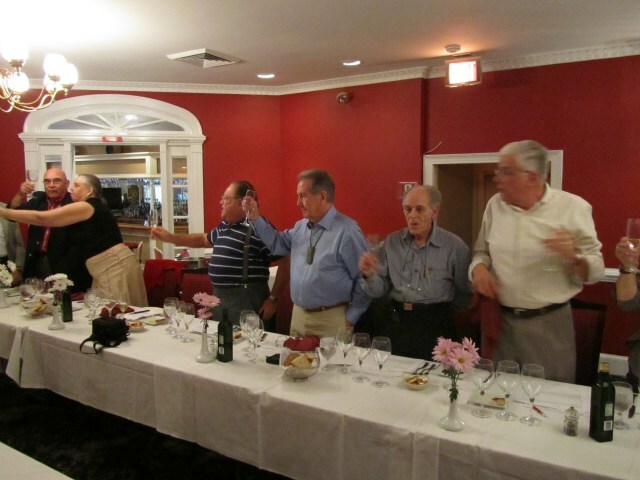 Our dear Wine Club in Virginia, whose members are mainly retirees from the OAS, the IDB and the World Bank, has recently celebrated its tenth anniversary. Once a month, we meet for lunch at a good restaurant to enjoy a delicious meal and taste four types of wine, in an atmosphere of comraderie and enthusiasm. These lunches have been held without skipping a single month since the club’s foundation, so we’ve had 123 of them, including the most recent one, held July 29th 2011 at Da Domenico restaurant in McLean. The club currently has 35 members (30 regular, 5 honorary), and its board includes Juan Luis Colaiacovo (President, a former OAS employee), Alvaro López (Vice-President), Hugo Benito (Secretary) and Ítalo Mirkov (Treasurer). At the celebration of our tenth anniversary of the club’s foundation during our May 2011 lunch, we gave President Colaiacovo a plaque commemorating the event. The ceremony was video recorded, and it is available on YouTube at http://youtu.be/5vzlE0wvQvw. Every month we agree by rotation on a member to be in charge of selecting and buying several bottles of wine with an average price of $15 each. We taste the white wine first and then three kinds of red wine. The member who chose and purchased the bottles also provides information about the main characteristics of each wine and the region and country where they are produced. Each and every lunch is an opportunity to share with old-time friends, new members and guests, and enjoy their conversation. We exchange comments about the different wines we taste and laugh with the stories and anecdotes some of us tell. It is also traditional that participants, if they wish to do it, fill out an individual form indicating the alcohol content, balance, bouquet, color, fragrance and taste of each wine. Those interested in attending a lunch or joining the club, please get in contact with any club member. The author’s email address is bolivarcobos@yahoo.com. This entry was posted in Photos and Videos - Club del Vino and tagged 10 years, Banco Interamericano de Desarollo, BID, bolivar cobos, cobos, en contato, jubilados. Bookmark the permalink.